NEW YORK — Take the “white savior” formula of 2009’s “The Blind Side,” in which a Caucasian of considerable means changes the life of an impoverished African-American, mix in a little of “Driving Miss Daisy” from 1989, and you have “The Upside” (STX). Director Neil Burger and screenwriter Jon Hartmere have remade a popular 2011 French film “Les Intouchables,” itself taken from Philippe Pozzo di Borgo’s 2001 book, “Le Second Souffle” (“The Second Wind”), based on the real relationship between a disabled man and his caregiver. Like its predecessor, it takes hard swerves between comedy and drama, and also relies on the substantial, unflagging charisma of the two leads. 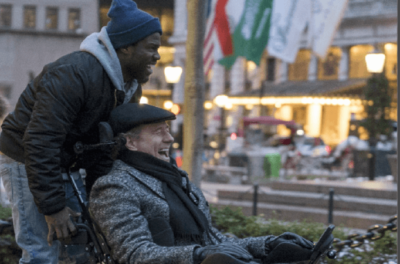 Kevin Hart is Dell, a recent parolee for various crimes who desperately needs employment to avoid returning to prison, and Bryan Cranston is Phillip, an uber-wealthy investment guru in a Park Avenue penthouse who is a quadriplegic as the result of a hang-gliding mishap and also a lonely widower. Dell, of course, has no qualifications as a caregiver, and thinks he’s interviewing to be a janitor. Phillip, who hates being controlled, somehow finds Dell’s insouciance and flat-out ignorance refreshing. So off we go on an adventure of “connection,” with Phillip’s suspicious and genuinely caring executive, Yvonne (Nicole Kidman), hovering in the background. Dell’s other motivation for newfound responsibility involves taking care of his estranged ex-wife, Latrice (Aja Naomi King), and their son, Anthony (Jahi Di’Allo Winston), who are living in crumbling public housing. And his old thieving habits, we see, are difficult to break at first. There’s considerable learning ahead. Dell picks up quickly on Phillip’s love of opera and makes the connection to the singing of Aretha Franklin. In turn, he introduces Philip to marijuana and late-night fast-food binges, which are mostly an excuse to drive one of Philip’s luxury cars. How many laughs can be extracted from Dell’s realization of what’s involved in changing a catheter? Let’s just say there’s an entire stand-up routine involved. Dell also later tries to help Phillip reconnect with romance. The larger point the filmmakers are trying to convey is that these two actors are having a very good time, Cranston with his dry observations and Hart performing his specialty of manic squeaky-voiced fear. So why can’t we all just enjoy the ride? Well, because first of all, old stereotypes of race and class still have the power to hurt, and hurt deeply. Second, there’s a warped outlook here in which money solves all anxiety — and, in large quantities, even becomes morality itself. The film contains benignly viewed marijuana use, sexual humor and references and fleeting rough and crude language. The Catholic News Service classification is A-III — adults. The Motion Picture Association of America rating is PG-13 — parents strongly cautioned. Some material may be inappropriate for children under 13.